Hillside Candy, a manufacturer of confections, announced today that it will introduce new stand-up gusseted bag packaging and two new flavors for its hand made GoNaturally organic candy line at the 2008 All Candy Expo in May. Yes, a candy expo. Fez from "That '70s Show" would be in heaven. The candy is currently available in 8-ounce tub and bulk formats in four flavors: Ginger, Honey Lemon, Cherry and Honey. The new look in its GoNaturally organic candy line will feature a 3.5-ounce, stand-up bag. Six flavors, instead of four, and the bags are recyclable. The two new flavors:Pomegranate and Apple. The new bags are scheduled to begin shipping in mid-May at the suggested retail price of $2.79 to $2.99. 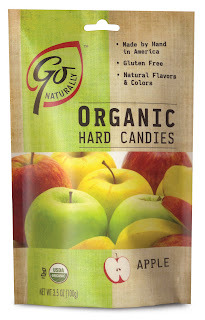 GoNaturally is hand made, gluten free, kosher, and USDA certified organic candy. Using organic evaporated cane juice and organic brown rice syrup for sweetness, the line is flavorful and refreshing. GoNaturally contains no trans fats, no preservatives, no corn syrup, no FD&C colors, and no hydrogenated oils. In keeping with the environmentally friendly concept, the GoNaturally packaging and twist wraps are all recyclable. Based in Hillside, N.J., Hillside Candy was established in 1945, and is the corporate umbrella and home of three brands of candy: Golightly, one of the niche brands in the sugar-free market; Hillside Sweets, a line of sugar-based hard candy; and GoNaturally. The brands will be among the sweet fix at the the 2008 All Candy Expo, from May 20-22 in Chicago’s McCormick Place Convention Center. Held annually in Chicago, the All Candy Expo is the largest confectionery and snack trade show in the United States and has 500 exhibitors. The list of exhibitors includes multi-national companies as well as small niche gourmet and specialty companies. The All Candy Expo draws visitors from nearly 70 countries.